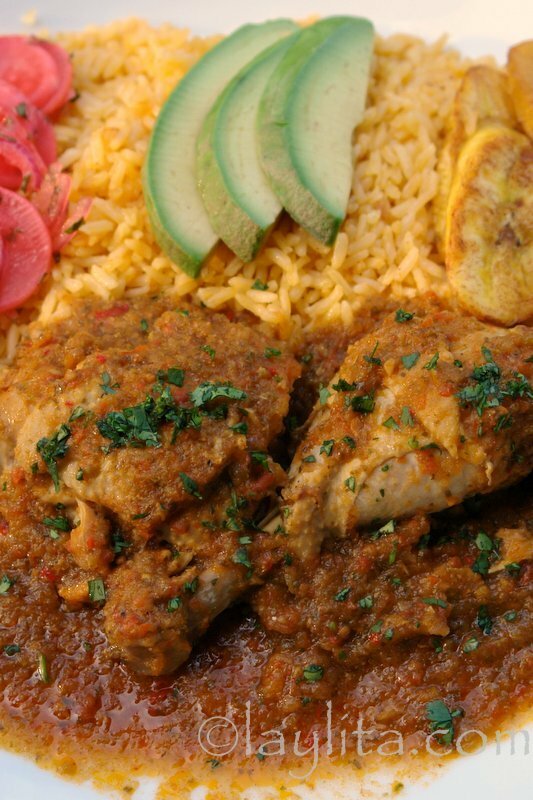 Seco de pollo or chicken stew is another delicious recipe from Ecuador. It is one of dishes that you crave on a day when you want a nice home cooked meal that not only satisfies your stomach, but also gives you that overall happy feeling. 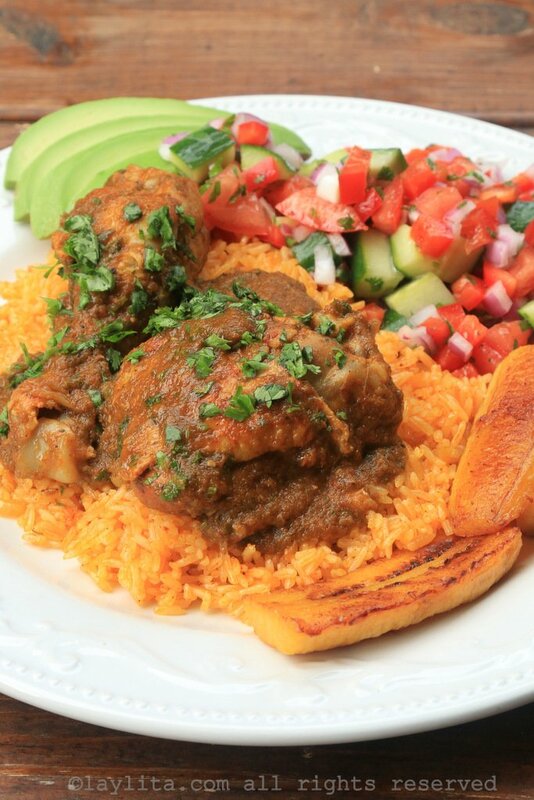 This dish is also known as seco de gallina criolla. If it is made with a young chicken it is called seco de pollo, and if it is made with an older hen it is called seco de gallina criolla. Traditionally it was a way to cook those older tougher hens and soften the meat by cooking it slowly in a sauce of onions, garlic, peppers, tomatoes, herbs and spices. 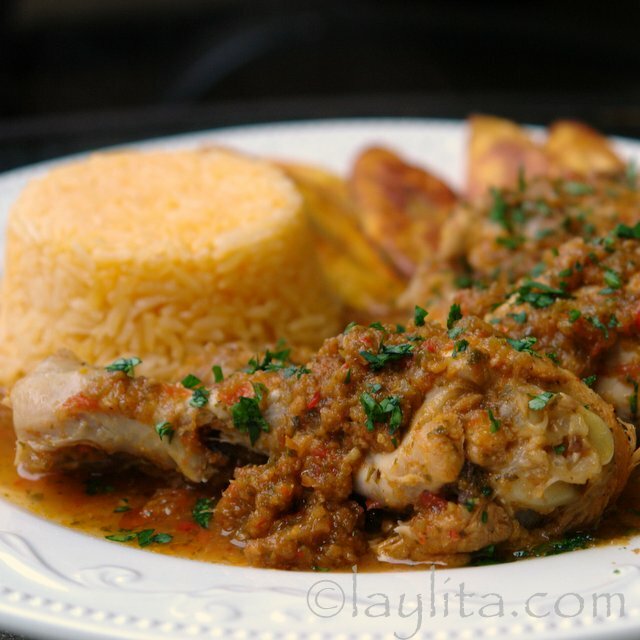 Seco de pollo or seco de gallina is an Ecuadorian chicken stew cooked slowly in a sauce of beer (or chicha), naranjilla juice, onions, garlic, peppers, tomatoes, herbs and spices. Rub the chicken pieces with the ground achiote, cumin, salt and pepper. Blend the beer and the naranjilla juice with the onion chunks, whole garlic cloves, tomatoes, bell peppers, hot pepper, cilantro, parsley, oregano to obtain a smooth sauce or puree. Heat the oil and brown the chicken pieces. Pour the blended beer vegetable mix over the chicken. Bring to a boil. Reduce the heat and cook on low for about an hour (if you were using an old hen it would take longer, but most supermarket chicken will be tender in an hour or less). If the chicken is tender, but sauce isn't thick yet, then remove the cooked chicken pieces, turn up the heat and cook the sauce until it's nice and thick, about 10 to 15 minutes. At this point I also like to taste the sauce and adjust salt/spices, if the flavor is slightly bitter from the beer you can neutralize it by adding some freshly squeezed orange juice/lemon juice. Once the sauce has thickened add the chicken pieces back to the pot and mix in the remaining chopped cilantro and parsley. 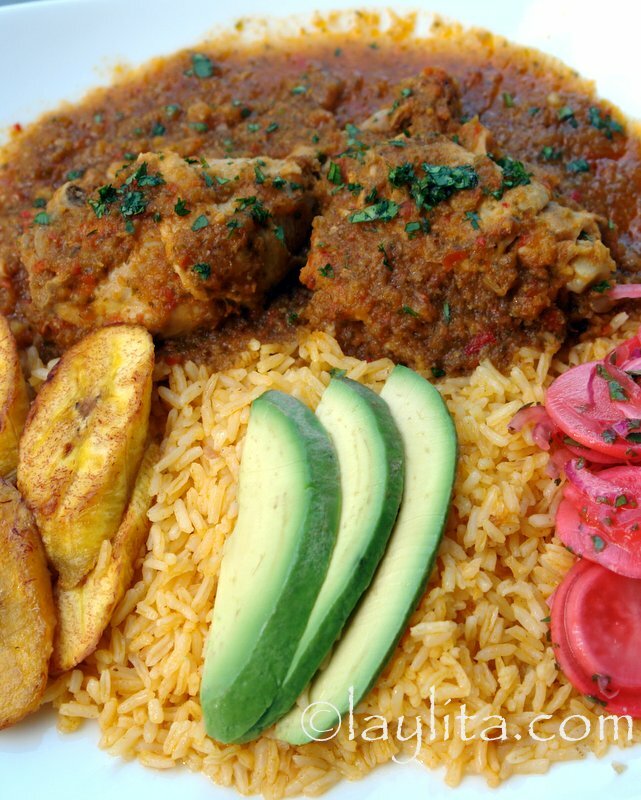 Serve with arroz amarillo or yellow rice and fried ripe plantains. Can also be served with avocado and a small salad. The traditional preparation also uses chicha – a fermented corn drink – instead of beer, though most people today prepare it with beer because it is much easier to find and tastes great. Sometimes naranjilla juice is also added. I recommend using a light and mild flavored beer, if not the flavor might be on the bitter side. If that happens, you can offset the bitterness by adding some citrus (orange, sour orange, lemon/lime, naranjilla/lulo juice) until you have the right balance. You can also use a mix of beer and citrus juice, like naranjilla or lulo juice. Other options for the liquid include a mix of half white wine and half orange juice. I find the flavor of chicha similar to a semi-dry apple cider, so apple cider is also another alternative to beer for this recipe. Seco de pollo is an easy recipe to make, but it can be time consuming if you are cooking a hen or gallina, since you have to wait for the chicken meat to get very tender – about 2 to 2 1/2 hours. A regular pollo or young chicken will cook much quicker, but the sauce might need more time to thicken. In that case, I recommend removing the chicken pieces and increasing the heat to thicken the sauce quicker. 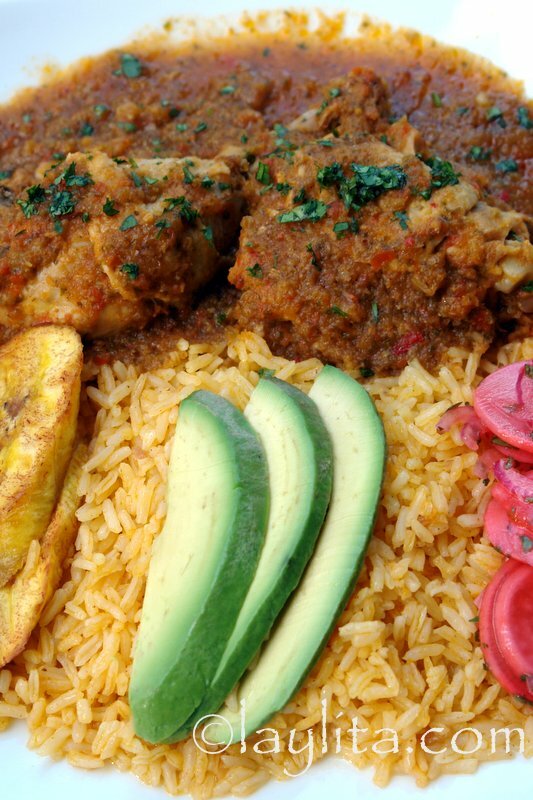 Seco de pollo is usually served with arroz amarillo or yellow rice -just add some achiote to the rice preparation -and fried ripe plantains. Those are the two must have sides. I like to also serve it with avocado slices, a small salad, and in this case some whole potatoes sauteed in butter. I usually use one red and one green bell pepper, but you can use any combination you prefer. Wow! Thank you for this! I was skeptical it would come out great, I was so wrong! This dish was delicious. I’m half Spaniard and half Irish and my husband was born in Cuenca. He loved this dish. Licked his plate clean! Thanks so much for all your awesome recipes Layla! Mi nombre es María Gracia y vivo en Mary Esther, FL. Quiero hacer el seco de pollo; pero me preguntaba si de repente lo puedo hacer en una olla de cocción lenta (trabajo mucho), y cómo me lo recomendarías cocinar si es el caso? Muchas gracias! Hola María Gracia – Si, se puede hacer en la olla de cocción lenta, el proceso es similar a esta receta. Yo le puse 6-8 horas de tiempo en la olla de cocción lenta. Lo unico es que el liquido no se espesa mucho, entonces si lo quiere un poco mas espeso, al final puede sacar las presas ya cocidas e incrementar la temperatura para reducir y espesar los jugos del seco. Tengo fotos del proceso y espero subirlas dentro de poco. Hi! i made many of your recipes, especially plantain ones! really good!!! 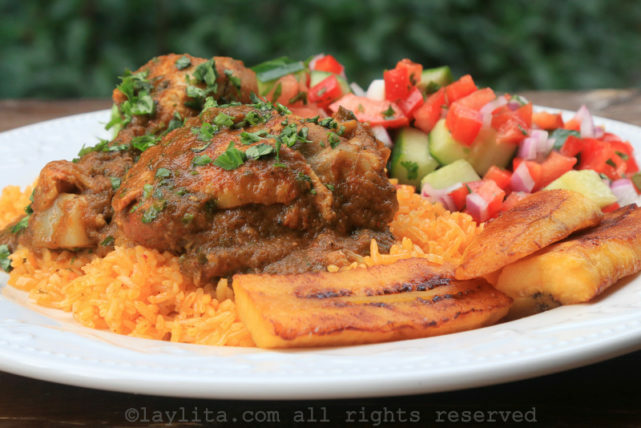 Today i was gonna make this seco de pollo because it looked so good! i did everything like the recipe said, the food looked and smelled great but when i tasted it, it was very bitter. I think it was the cilantro. Is it supposed to tase that bitter? No, it shouldn’t be bitter at all and the cilantro won’t make it bitter.. I’m guessing that the bitterness might have come from the beer, what kind of beer was used? It could be, I usually use very young cilantro so the the stalks are very soft. I made it once with Heineken and did find that beer flavor was stronger than when I use Corona. If you still have the seco de pollo, you could try to neutralize the bitterness by adding some orange juice/and or blended tomatoes, and cooking it a little more (remove the chicken pieces and cook the liquid mix until it reduces/thickens, then add back the chicken pieces). I was just in Ecuador for 6 weeks, and this was my favorite thing I ate while there. Thanks so much for the recipe!! By “bunch” of cilantro and “bunch” of parsley, do you mean the entire bundle we buy at the store? I made up some sauce this morning with the entire bunch of parsley and cilantro and my sauce looks too green to me. Hi Ami – Yes, I mean a whole bundle (medium sized). The sauce will be green when you blend it, but the combination of achiote/annatto plus cooking it will turn into a brownish red color by the time it’s done. I’m going to be making the seco de pollo today. I was wondering what type of beer is needed? Any beer as long as it isn’t too dark or bitter, Corona works great. I was wondering if I could make this with chicken breast?? Please let me know. Thank you so much! I love your other recipes, they always turn out amazing!! Yes, of course. I usually use an assortment since people have different preferences, and in Ecuador you usually buy a whole chicken and cut it up, but using just chicken breast (or any piece you prefer) will work also. Hi Laylita! I’m only going to be cooking for 3 people. Do I just cut all the ingredients in half? Yes – That would work, you might still have some leftovers. Thank-you Laylita, for these amazing recepies. I live in Canada and follow your webside all the time. 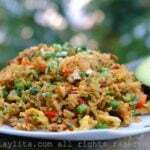 I have tried some of your recipes and the best is this seco de pollo. Es una delicia! love your recipes! I am making the seco right now, but I have a question. When I put it on slow to cook for 2 hours and a half, should the pot remain open or should the lid be on? I keep it partially covered for the first 1 1/2 hours and then uncovered for the last hour. Also, depending on the chicken (how young/tender it is) it could be done before that time. In that case I would recommend removing the chicken pieces and just cook the liquid for the remainder of the time so that it can thicken. Then add the chicken back to the sauce. I am from Ecuador but I live in Utah. I love this dish! thanks for the recipe. I do use beer to make this dish, the alchohol in the beer evaporates once it is cooked. So it is ok to cook using beer. I live in Ohio, USA and must say that your web page is amazing, congratulations!! 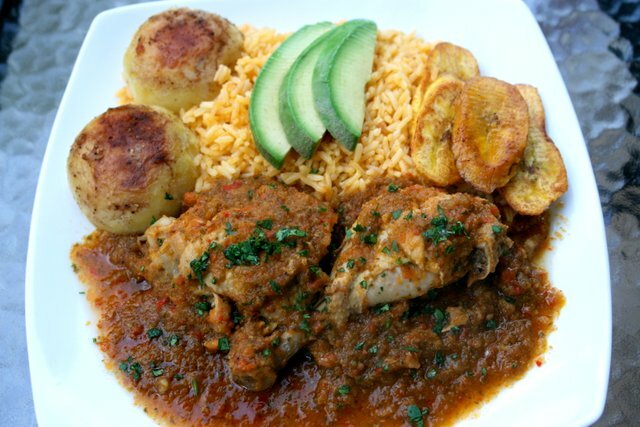 Seco de pollo is my all time favorite local dish and I love to cook it and feel back home in Guayaquil that way. Thanks. Fernanda where in Ohio are you from? I live in Columbus and I have made this recipe before but I substituted beer for Red Wine Vinegar and it tasted just like back in Guayaquil. There is a new Ecuadorian group meeting up here in Columbus. I just fixed my first ever Ecuadorian meal for my partner, who is from Guayaquil. Seco de Pollo. It wasn’t as good as his mom’s but it was darned close. Your recipes are easy to follow, and delicious. Thank you for letting me try to bring a little taste into our home. Humitas are next! Can you make this without using beer? Yes – you can use naranjilla juice or chicha, you will even get a very good dish using just chicken broth or water. Very nice recipe! When I was young in N.Y.I thought I invented i adding beer to tomatoes chilis chicken my Ecuatorian made laughes and said “Es una fria” Oh well great things happen spontaneously! I did think she was fooling me until I discovered it, Looks utterly scrumptious must make this wek! Hi, this dish looks amazing. I plan on making it very soon but im not too sure how easy it is to get my hands on some achiote/annatto, as im from the UK. Are there any alternatives, saffron, paprika or tumeric maybe? Is it used more for colour or taste as well? When I first moved to the US I couldn’t find achiote so I would use paprika as an alternative (the flavor is different but it adds the color). I have lived in Galapagos Islands, Ecuador for about 5 years. Seco de Pollo is my favorite!!! I had no idea that it had beer in it. I am glad to find a recipe in English. As soon as the cargo ships comes to port I am going to make it!!! I am Mormon and was a Mormon missionary in Ecuador. This was my very favorite dish. Every time people made it for me, I was in heaven. Then I got home and discovered that it is made with beer, which I don’t drink for religious reasons, and wouldn’t buy even to cook with, and so I won’t be eating it again. Sigh. It’s amazingly delicious, though. I’m loving reading through your site and finding food I enjoyed in Ecuador. I was in Loja for five months, and it’s just beautiful there. Hi Emily – You can try making with chicha (non alcoholic), naranjilla juice or even with just 1/2 orange juice 1/2 chicken broth. It will be close to the original. I’m Ecuadorian and my mom used to make this dish for us as kids.. LOVED IT!! Now that I’m married with kids, I too make it for my family and my kids can’t get enough!!! This was amazing. The aromas filling our home were so enticing that I could barely wait for the two and a half hours’ cooking time. We probably did the un–authentic thing and added our rice while it was cooking, but it was absolutely delicious! I learned a dish almost exactly like this, but it had additional ingredients of a few tsp of prepared mustard soy sauce. Does this sound familiar to anyone? It’s from mi abuelita from Junin Ecuador, God Bless her! 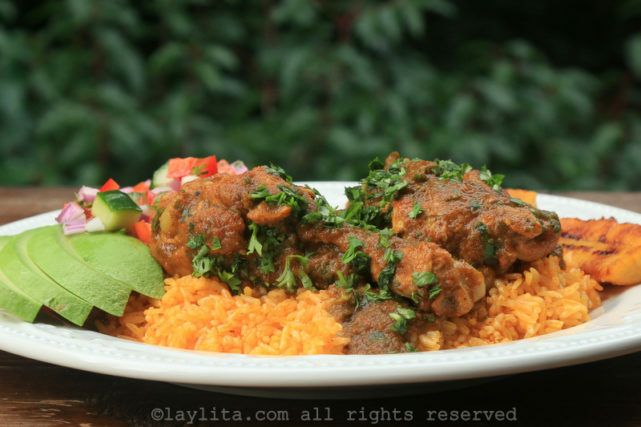 This recipe is beautiful, the dish is amazing and I don’t think I can go back to making pollo guisado anymore. I have tried many latin recipes but this is by far the best one I have come across. This is the best ever. I add potatoes to mine. This is one of my favorite dishes. You can’t go wrong. I even use the sauce to bake a porks legs. It’s really good. Thank you Laylita for this wonderful recipe! I have spent a lot of time in Guayaquil as my boyfriend lives there. His mom made this dish for me several times and I loved it! I was craving it the other day and found this website and recipe so I decided to make it for my mom and dad. They both loved it and it came out delicious! I told my boyfriend and now he can’t wait for me to make it for him next time he is here. We are planning on getting married next year and for him to move here to the States, so it’s important that I know how to cook some of his favorite Ecuadorian food! I want him to feel at home and comfortable here. After I told him about the success of the seco de pollo, he jokingly asked me when was I going to learn how to make ceviche de camaron. I told him that would be my next venture, as I’ve already found the recipe for it on here. Can’t wait to try it! Thank you again!! Laylita, Thank you soo much for this recipe. It may have saved my marraige. My husband is Ecuadorian and I am a southern girl who has mastered southern cuisne but not South American cusine. For the first time ever he was impressed! I have tried other recipes but they have failed to satisfy him. He cleaned his plate last night…. I am forever in debted to you. My husband is Ecuadorian and Seco de Pollo is his favorite dish. I’m sooooooo happy that you have this and a lot of other Ecuadorian recipes on your site. This is great!!!!!!! I’ve already made the aji criollo and the pickled onions…they turned out wonderful !!!!! Thank you!!! I love this site! 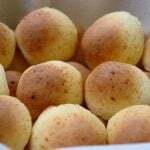 I grew up in Guayaquil and now that I live in the States I miss the food immensely. I would always forget little things in the recipes, but now I can make them just like we did at home! Muchisimas gracias de mi parte y de parte de mis amigos q’ comen conmigo! I am so glad I found your website. Your recipes look very authentic. I used to live in Ecuador and miss it very much. Do you have an idea for a beer substitute in this recipe? Would chicken broth work? My parents don’t allow it in the house even for cooking. Also… Do you have a recipe for Caldo de Bagre? Hi Rebekah – you can use chicken broth as a substitute, you could also use naranjilla juice (if you can find it) or chicha. I will post a recipe for caldo de bagre in the next few months. muchisimas gracias mi senora cosina muy rico, ahora con sus recetas yo le estoy haciendo competencia pero al fin de la cena ella dice k le falta algo. My sister, a self-proclaimed carishina, raved about your site because it helps even the lesser-gifted home cooks surprise everyone with mouth-watering renditions of the foods we so love from Ecuador. I have several specialized books on the subject, but none ever mentioned beer on seco de pollo. I am sure this dish will be exquisite. I just made Seco de Pollo and my husband LOVED IT! I literally JUST finished eating this dish, with the arroz amarillo and platanos masduro as you suggested, and it was DELICIOUS! My ex-boyfriend is from Ecuador, and his mother made this stew for me one day and I fell in love with it. Now I can make it myself. Very good! Hi Laylita! My girlfriend and I tried this over the weekend, to eat with football. I made it with Corona, and it came out spectacular. I also added a touch of my own: Chunky tomatoes and mushrooms, added right near the end of the cooking process. I look forward to trying just about everything on your site! Mari – Just replace some of the beer with the naranjilla juice. Wow! The flavor is incredible. My Ecuadorean Grandmother used to make this dish when I was little. She is still alive but no longer cooks like she used to. I am so thankful to have found this recipe. The taste brings back so many memories! Thank you so much for the wonderful recipe… I made it last night for my family and boyfriend and they loved it, also did a twist on it and took the chicken off the bone, so shredded chicken basically and mixed it with spaghetti pasta and it came out real yummy! My mom, originally from Ecuador was very impressed! she won’t admit it but maybe it was even a little better than hers…. haha :))) Thank you! and keep em coming! I made this dish last night, and it was amazing. Even my cats went crazy for it. I have tried many recipes from the Food Network, and magazines, and you never know what you are going to end up with–your recipes are right on, they taste incredible. When my partner was flattering my cooking, i said to him, i wish i could take credit for this, but it isn’t my recipe. I told him about you. Anyways, thanks again. p.s. my next recipe was supposed to be Guatita, but i can’t find a spanish meat place. I’ll keep looking. Hi Laylita – I made the chicken stew using corona and it was delicious, I had made chicken stew before but never with beer. My husband and the boys loved it. I served it with yellow rice and fried sweet plantains. When my mom comes to visit next time I’ll make it for her. She never used beer to make stew. I already tried your recipes for ceviche de camaron, carne en palito y menestra de lenteja, and everything was delicious. I LOVED the ceviche. Just like the ones I used to eat in Salinas. Thanks for your great recipes! I refered your website to my sister and she’s very excited about it, she also already made carne en palito. When she visits me next time we will make ceviche the pescado for the both of us. Our american husbands find it too acidic for their taste. I hope that if you have a good recipe for caldo de bola, you post it soon. Bye! Hi Thalia – I use either something light or medium, a pilsner type beer is typically used in Ecuador. I’ve made it with Corona, Hoegaarden white beer, Stella and also with Heineken (but this last one was slightly on the bitter side). What kind of beer should one use? Dark or light? This one is a must-try. Seems like a perfect home-cooked chicken dish, for those days when we’re in need of great comfort.